Flecainide is an antiarrhythmic agent which is being used increasingly for the management of super-ventricular arrhythmias. Overdose with flecainide is frequently fatal with mortality reported as high as 22% due to arrhythmias, myocardial depression and conduction defects leading to electro-mechanical dissociation and asytole. Supportive measures are often required during the case and previously have included inotropes, extracorporeal membrane oxygenation and cardiopulmonary bypass. 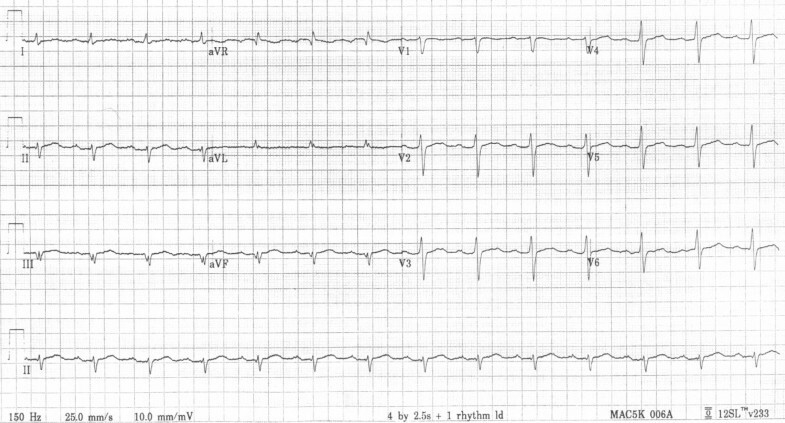 A 47 year old lady presented to the emergency department with a four hour history of severe central chest pain. 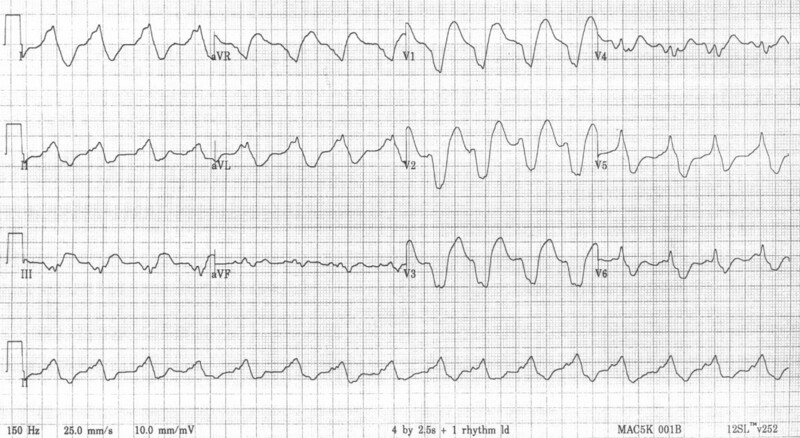 Her ECG showed atrial fibrillation and broad QRS complexes with a sine wave appearance. 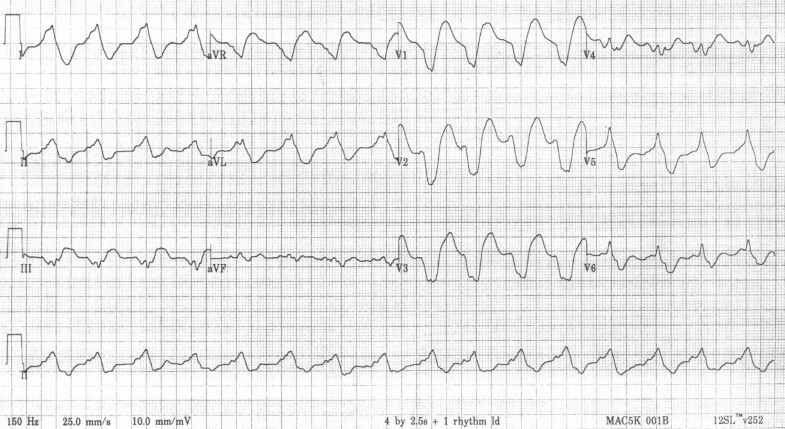 She had a past history of paroxysmal atrial fibrillation and significant psychiatric history. Following thrombolysis for a presumed myocardial infarction she developed cardiogenic shock with severely impaired left ventricular function. An intra-aortic balloon pump was inserted and coronary angiography demonstrated normal coronary arteries. With inotropic support she improved over 48 hours, with both her QRS duration and left ventricular function returning to normal. Biochemical testing following her discharge demonstrated significantly elevated levels of flecainide. The use of an intra-aortic balloon pump is a useful supportive measure during the acute phase of flecainide overdose associated with severe myocardial depression. Flecainide is an increasingly used class 1C antiarrhythmic drug used for the management of both supra-ventricular and ventricular arrhythmias. It causes rate-dependent slowing of the rapid sodium channel slowing phase 0 of depolarisation  and in high doses inhibits the slow calcium channel. Flecainide also slows conduction in all cardiac fibres, increasing conduction times in the atria, ventricles, atrio-ventricular node and His-Purkinje system and can cause myocardial depression. A 47 year old lady presented to the emergency department with a four hour history of severe central chest pain radiating to the neck. She had a significant psychiatric history with multiple episodes of self harm and had previously been hospitalised with behavioural problems. The patient had a history of multiple admissions with cardiac sounding chest pain, all with normal ECG and cardiac troponin levels. An outpatient stress nuclear perfusion scan was normal. The patient also had a history of arterial hypertension and paroxysmal atrial fibrillation and was managed on a combination of amitriptyline, losartan, amlodipine and flecainide. During this admission she repeatedly denied taking an overdose. On arrival at our institution, transthoracic echocardiography revealed global moderate impairment of left ventricular function. Emergency coronary angiography was performed demonstrating normal epicardial coronary arteries and left ventriculography confirmed the echocardiography findings. An intra-aortic balloon pump was inserted with a rapid improvement in haemodynamics. Over the following 48 hours the patient was weaned from the inotropes and the intra-aortic balloon pump was removed. During this period her QRS duration gradually returned to normal (figure 3) with left axis deviation and first degree heart block (which was present 12 months previously). Repeat echocardiography demonstrated normal left ventricular function. Following discharge her flecanide levels were returned as 2340 μg/l (normal therapeutic range 200–700 μg/l) at 24 hours post admission. The mortality of overdose with class 1C agents has been reported as high as 22% compared to less than 1% for all drug overdoses . In such cases fatal outcome is often related to the progression of conductions disturbance to electromechanical dissociation and asytole. 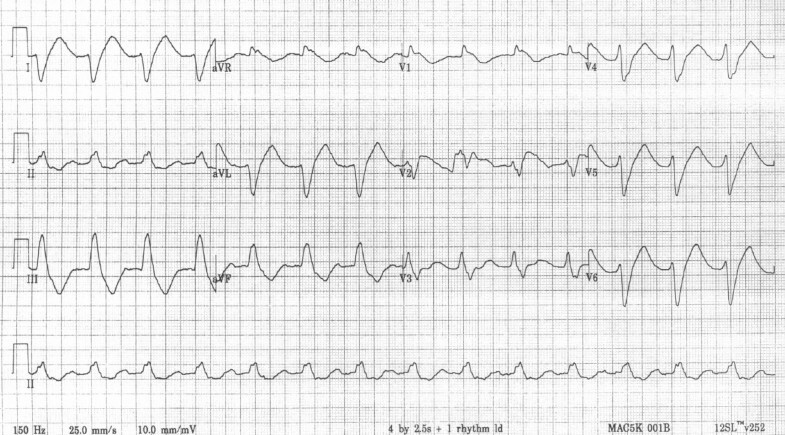 Although less common, ventricular arrhythmias may occur and are frequently unresponsive to electrical cardioversion . Other features may occur due to impaired tissue perfusion including hypoxia, metabolic acidosis, coma and convulsions. Hypotension can occur within minutes of a significant flecainide overdose, and subsequent reduction in hepatic and renal flow leading to prolongation of the duration of toxicity. The proarrhythmic effects of flecanide may be related to flecainide promoting re-entry in ventricular tissue . Worsening of existing ventricular arrhythmias or the onset of new ones can occur in up to 30% of patients . Flecainide depresses cardiac contractility especially in patients with underlying impairment of function. The management of an overdose includes supportive measures and specific pharmacological agents. The benefit of activated charcoal is uncertain but this may be considered within the first hour of ingestion . Hemodynamic support may be required including the fluid replacement, inotropes and an intra-aortic balloon pump as in this case. Both extracorporeal membrane oxygenation and cardiopulmonary bypass have been used in cases of severe overdose [6, 7] but the use of intra-aortic balloon pump has not previously been described. Sodium bicarbonate is recommended for a metabolic acidosis that persists despite correction of hypoxia and adequate fluid resuscitation . 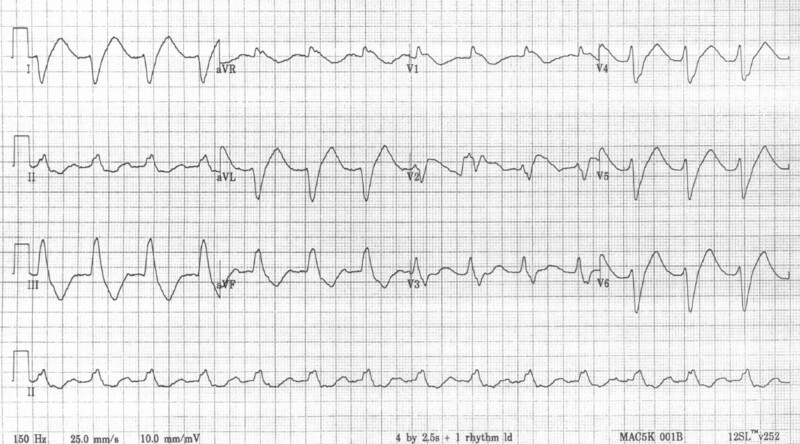 Following administration of intravenous sodium bicarbonate QRS narrowing has been reported and also termination of ventricular tachycardia. . Ventricular arrhythmias may be difficult to cardiovert electrically and both lidocaine and amiodarone have been used successfully in such cases [3, 10]. Cardiac pacing may be required but ventricular capture may be poor . Flecainide overdose is frequently fatal and supportive measures including the use of intra-aortic balloon pumping may be required for severe myocardial depression that may occur during the acute phase. JT, AM and PB drafted the manuscript. NW made final alterations to manuscript.